Our used bulletproof trucks include tactical trucks, prisoner transport trucks and money transport trucks to name a few. We also offer used bulletproof SWAT vehicles, armored cars and used bulletproof vans from dealers like Ford and GM. 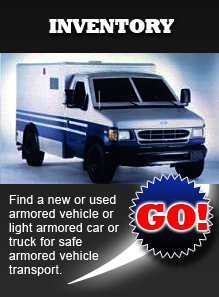 Look to The Armored Group for bulletproof trucks, armored vans and a variety of other used bulletproof vehicles. Our used bulletproof vehicles come from dealers such as Ford, GM, and Chrysler. Choose your armored cars from the industry's number one dealer, The Armored Group. 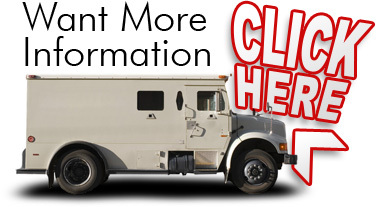 Money transport trucks / bullion trucks are one of our most popular lines of used bulletproof trucks. We also carry used bulletproof SWAT vehicles, used bulletproof vans from Ford, and more. When you're in the market for armored cars and armored vans, look no further than the used bulletproof vehicles at The Armored Group. If you're in the market for used bulletproof vehicles, and more specifically used bulletproof trucks, The Armored Group can help. Here you'll find tactical trucks, prisoner transport trucks and more, as well as used bulletproof vans and used bulletproof SWAT vehicles. Learn more about what we can offer you.